This the trade route that Vasco da Gama took to India to trade spices and jewels. 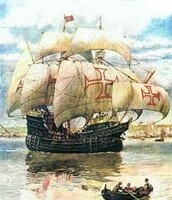 This is also the route he took to return the second time to capture the land in the name of Portugal. 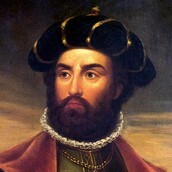 This is a portrait of Vasco da Gama after he returned from India for the first time. He returned with many riches which included spices and jewels. This is a picture of one of the ships that he watched built. He sailed this ship to India and back the first time he sailed. Vasco da Gama brought spices back to Portugal to widen their horizons of their cuisine. Their cuisine had a more exotic flavors, which led to more trade between the two countries. Also, the jewels collected made the Portuguese more rich than they have ever been. It increased their riches and brought them back to India to collect more. Today, Portugal has many spices used in their daily life. Out of 170 people that attended his voyage with him, only 55 people survived the harsh conditions.